While just about every new feature in iOS 5 is a welcome one, there are a handful which, well, aren’t all that welcome. Take the example of the updated Camera.app: in iOS 5 it only allows the pinch-to-zoom gesture for zooming in and out. This certainly works, but it is just isn’t as comfortable to pull off as double-tapping the screen and then moving a slider up/down. It just so happens that the iOS hacking community has pumped out a tweak for this: it’s called ZoomIsBack and it lets you zoom in/out using a slider. 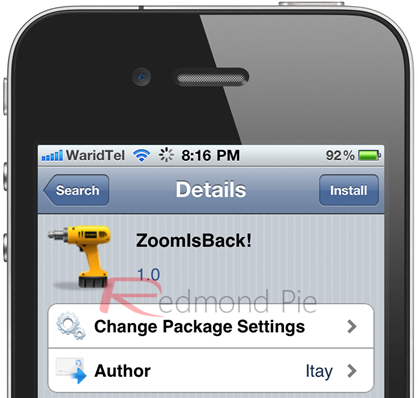 Developed by Itaybre from Uruguay, ZoomIsBack is an all-new tweak for iOS devices such as the iPhone 3GS/4 and iPod touch 3G/4G on iOS 5 that brings the zoom feature of iOS 4 to iOS 5. ZoomIsBack is a simple tweak that replaces the pinch-to-zoom feature with the older move-slider-up-down one. Once installed, you just open up Camera.app and then double-tap to bring a slider up on screen which you can slide up and down to zoom in and out. That’s it. The new iOS5 requires Pinch to Zoom in Camera.app, but with ZoomIsBack, you can show the slider with Double Taping the screen. No icons are added to the homescreen. No options to configure. We’ve tested the tweak on an iPhone 4 running iOS 5 and can confirm that it works as claimed. I personally am against the very act of zooming in/out on a camera which offers digital zoom only. This is because when you’re digitally zooming, all you’re doing is basically cropping the photograph. Instead of digitally zooming, it is better to move in closer to the object you want to photograph and then, maybe, crop out unnecessary details later in a photo-editing program like Picasa. Anyway, you will need an iOS device jailbroken on iOS 5 for this to work. You can follow our step by step guide posted here to jailbreak your iPhone, iPad or iPod touch on iOS 4.3.5 using Redsn0w (or PwnageTool). For jailbreaking iOS 5 tethered using Redsn0w (or Sn0wbreeze). If you’re interested, ZoomIsBack can be installed for free from Cydia under BigBoss repo. Do let us know what you think of it in our comments section on Facebook!